The Mote solid oak fireplace mantel and black granite set utilises both old-world character along with rustic charm that lends an inviting atmosphere to any living space. 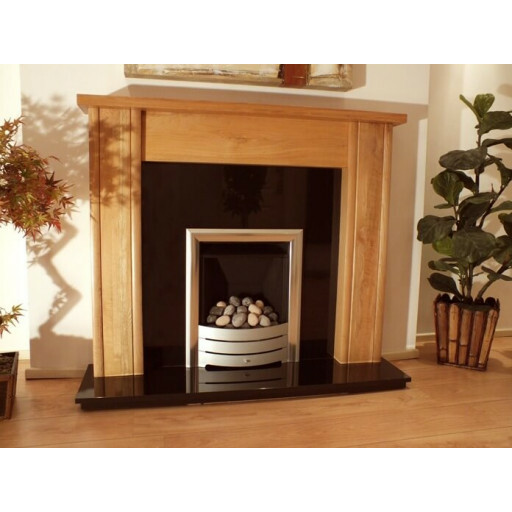 This sophisticated fireplace has been crafted using the finest quality kiln dried solid oak. This solid oak is the best that money can buy, resulting in a handsome fireplace that is not only durable but also extremely attractive. Its solid construction means that the Mote solid oak fireplace can be enjoyed from one generation to the next.The black granite hearth and back-panel that accompanies this Mote solid oak fireplace makes for a dramatic contrast. This is an excellent fireplace choice for use with solid fuel, electric or gas fires with some modification. This stunning fireplace is part of the Emerald Collection, featuring natural wood and granite that easily complements any type of existing home décor. All of the oak used to create this work of art is hand selected to ensure consistency in colour, grain and quality, guaranteeing a handsome fireplace that displays a uniqueness as well as distinctive character that adds greatly to the ambiance of any room.